(10 May 2009 – Hong Kong) From now to 28 May, people on the streets of Kowloon and Hong Kong will be able to have a closer encounter with Amazing Asian Animals, Ocean Park’s newest attraction area. 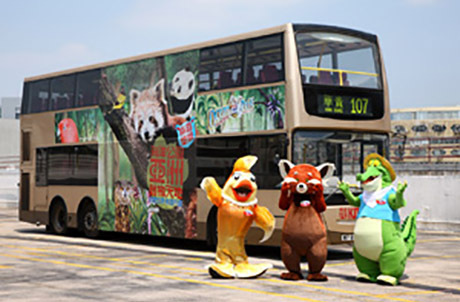 Forty double-deck buses operated by Kowloon Motor Bus and running on cross-harbour routes 101, 102, 104, 107 and 680 will sport new liveries themed on all the rare animals featured at Amazing Asian Animals. 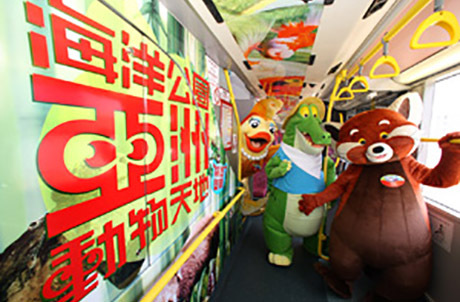 Among the 40 buses, five of them will become a virtual attraction-on-wheels as Ocean Park’s giant pandas, red pandas, the Chinese salamander, the Asian small-clawed otters and the Chinese alligators will be presented in the entire bus interior, from the staircase, bus ceiling, to each seat back. Catch one if you can, and head on down to Ocean Park. According to Ocean Park's Executive Director for Sales & Marketing Paul Pei, bus body advertising is an effective means to gain extensive exposure and penetration in the local market. "The routes we chose can reach a lot of our audiences from almost all the four corners of Kowloon, Hong Kong and the New Territories. 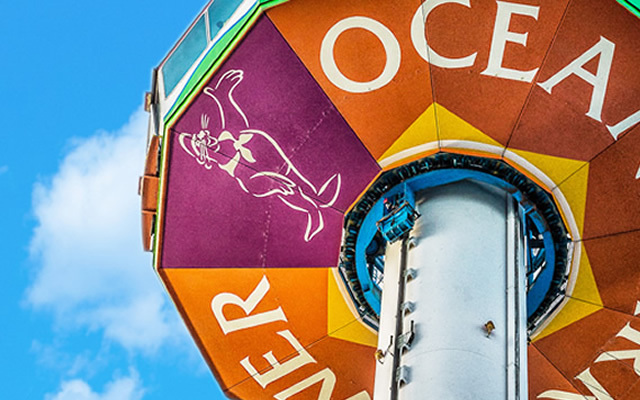 The message is: Fantastic surprises are waiting for you at Ocean Park. Just hop on a bus, interchange at appropriate points, and you'll be at Ocean Park in no time!" To celebrate the opening of Amazing Asian Animals, Ocean Park developed three mascots: Goldie, Later Gator, and Redd, which joined the existing Ocean Park mascot family just recently. Amazing Asian Animals is the first major attraction in Ocean Park's $5.5 billion Master Redevelopment Project to be completed. The area will feature eight unique attractions including Giant Panda Adventure, an impressive habitat for rare species such as the giant panda, red panda, Chinese giant salamander, Asian small-clawed otter and Chinese alligator. Meanwhile, the stand-alone exhibit, Goldfish Treasures, will feature exclusively over 300 goldfish collection of all shapes, sizes and colours, including the largest goldfish variety in the world. The Amazing Bird Show will also return with a new façade. The other attractions will include Panda Village, and the Wishing Tree. Opening in the summer will be Emerald Trail and the Suspension Bridge. To give guests a totally immersive experience in this area, Amazing Asian Animals will also present the future Waterfront (currently the Lowland) area’s first dining and banquet facility – Panda Café – which features a host of popular Southeast Asian dishes, including signature Sichuan cuisines, and the Park’s first themed and largest signature souvenir shop, Panda Kingdom Shop, which is brimming with over 5,000 animal-themed items in over 350 styles. Photo 1: 40 KMB buses around Hong Kong are now fitted with thematic Amazing Asian Animals decorations. From the left - Ocean Park mascots "Goldie", "Redd" and "Later Gator". Photo 2: Five of the 40 buses in Amazing Asian Animals livery are filled with pictures of lovable animals, allowing passengers on the move to learn about animal ambassadors in the attraction.